Is there a better alternative to MatrixSolver? Is MatrixSolver really the best app in Mathematics category? Will MatrixSolver work good on macOS 10.13.4? MatrixSolver is a time saving tool suitable for high school students or anyone else who requires a matrix calculator with more than the standard minimal output. MatrixSolver allows you to see the solution process for all matrix functions step by step. 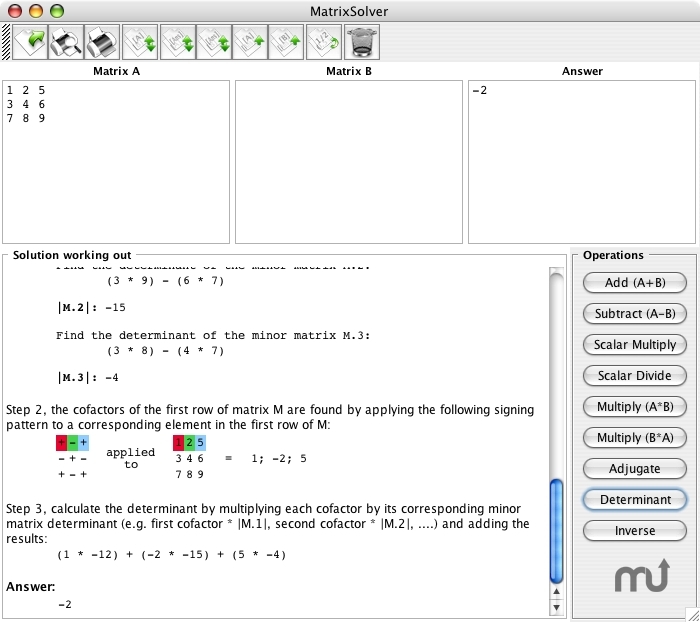 With MatrixSolver, you will not only receive an answer but a full mathematical justification with a written summary of each step, discussing the process. For more information, please view MatrixSolver's product page. Version 1.0.10: Release notes were unavailable when this listing was updated. MatrixSolver needs a review. Be the first to review this app and get the discussion started! MatrixSolver needs a rating. Be the first to rate this app and get the discussion started!